EOG this week 88.5 cc rolled out to 4/5 and up to 89 for 0.20 credit. Cost basis 92.63. Should be a few more rolls to break even. EOG has excellent premiums but hard to #pietrade. It will move $6 in a week. This one better to swing trade/time I think. #Earnings #DoubleCalendar Here’s the performance this quarter of double calendars. It is performing better than last quarter, with over $1,700 in profit, using 5-lots. NOTE: NTAP here is accounted as full loss, even though I will probably hold stock in to next week. NOTE ALSO: INTC here is accounted as taking stock assignment and then closing all a week later. What I actually did was close only half, and converted the other half of stock into a #PieTrade. #LongPuts #LEAPS -I’m a little disappointed in this one. It could’ve been a really good one but nat gas just imploded way faster than I thought was possible and my ratio was a little high on the put sales. On the bright side, between this and BOIL the Nov spike worked out ok.
#SyntheticCoveredCalls Sold to Open $PYPL Nov 16th 88 calls for 1.15. #pietrade tweak I am considering…. #pietrade tweak I am considering. On the initial put sale, I may pair jade lizard with them. Bring in a little extra income, if it does not hit the short strike keep the additional income. 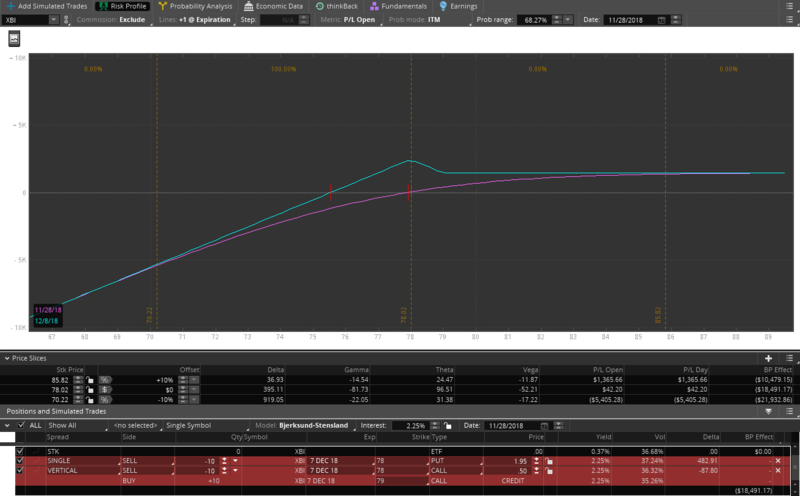 Then if assigned on the put, instead of selling straight CC may sell a call credit spread. Then if called out you may also get a runner on the long calls. Or if nothing else will give you the ability to ratio it if moving around a lot. As I experiment with this will post results. In looking at more recent trades it certainly would have helped. Currently #pietrades yield about 30-40 percent annualized on cash accounts, 40-50% on margin. Trying to bump that up a little and at the same time reduce risk.